Disclaimer: I am not vegan. Now that I got that off my chest, I want all meat lovers reading this to stick with me here since the food at Gracias Madre was so delicious. When I walked in, I was blown away by the décor. The indoor dining area and large patio were both very spacious and comfortable. The colors were bright and welcoming with beautiful tiles surrounding a bar showcasing extensive tequila options. 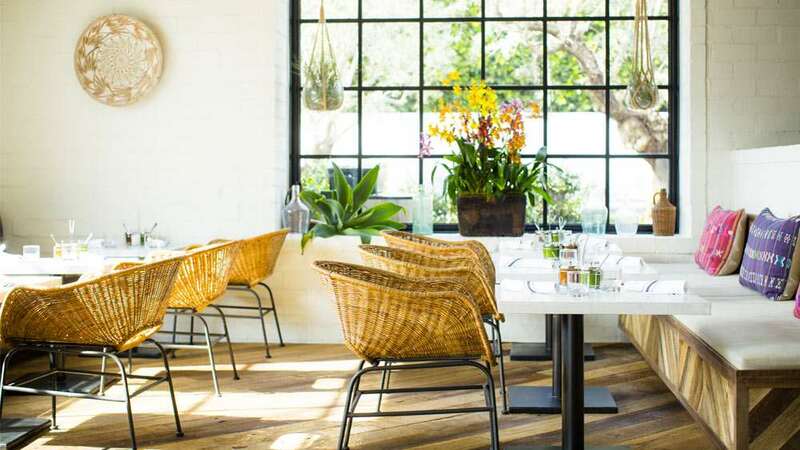 Gracias Madre exceeds expectations with its “organic, farm fresh, locally sourced, full of flavor and love” cuisine. Executive Chef Chandra Gilbert has an impressive repertoire, including Café Gratitude (esteemed vegan restaurant) as Director of Operations. Beverage Director Jason Eisner has made a menu that highlights small-batch mezcals and tequilas. Even the cocktails are made with local ingredients and house made syrups. Now, let’s talk about the menu. I chose to start with the gordita appetizer that was a potato masa cake, with warm salsa verde, avocado, and cashew crema. Surprisingly, the crema tasted very similar to sour cream and it was really light. I was also drawn to the coconut ceviche tostada. That one blew my mind. They take coconut meat and slice it into little pieces,adding lime juice, guacamole, pico de gallo and lettuce. The texture felt exactly like what a fish ceviche would. It was delicious. Their menu had plenty of different options and the staff was very knowledgeable. Popular items include flash-fried cauliflower with cashew nacho cheese and lemon or the potato and chorizo made of tempeh quesadilla. 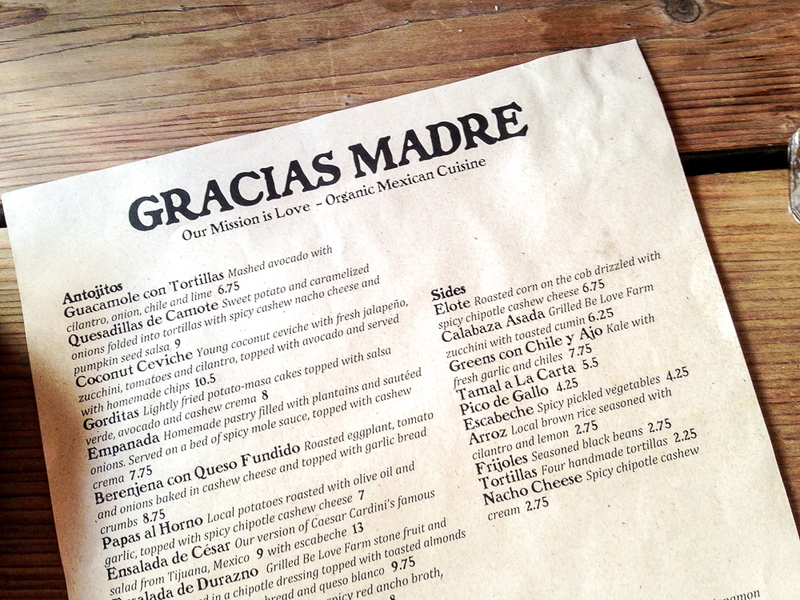 Gracias Madre also offers Brunch on the weekends and an even more extensive dinner menu. Check it all out here. The drink program there is also quite impressive. Options include a Boozy Popsicle with Mezcal, pineapple and jalapeno or snow cones like La Quinceanera featuring tequila blanco, muddled kiwi, mint, lemon, agave nectar, lime bitters, and shaved ice. My favorite hour is happy hour and theirs is from 3 p.m. to 6 p.m. Options include $5 margaritas and some food items at a discounted price. I cannot wait to go back, and didn’t miss eating meat at all while at Gracias Madre. The menu is so different from typical Mexican and the flavors really shine, so I totally forgot it was even vegan. I would definitely recommend it and am excited for a fresh approach on Mexican, my favorite cuisine. Meatless Mondays is sounding better and better.